According to recent reports from Reuters and the Times, the top two contenders in the race to become Mitt Romney’s window dressing are boring former Minnesota governor/mullet-sporter Tim Pawlenty and boring Ohio senator Rob Portman. But a new Fox News poll shows almost no Republican voters actually want these men on the ticket: Portman is the top preference of 3 percent, Pawlenty of 2 percent. 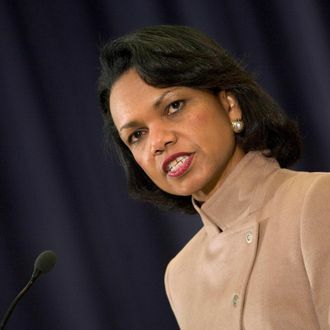 In first place, as usual, is Condoleezza Rice — a pro-choice, single, black woman — with an overwhelming 30 percent. Get ready to be disappointed, 30 percent of Republican voters!